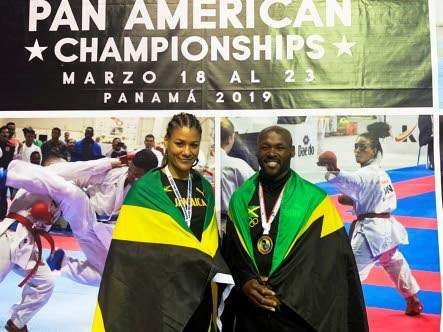 RYAN Foster, general secretary of the Jamaica Olympic Association (JOA), anticipates a strengthening of Jamaica’s medal chances at the upcoming Pan-Am Games in Lima, Peru, given the historic qualification of karate representative Jessica Cargill. Additionally, Foster recognised the success of members of the Jamaica karate team that participated at the Pan American Championships and noted their commitment in granting opportunities to the nation’s sportsmen and women. “The JOA is extremely happy to have fully sponsored our karate team in the Pan American Championships, with Cargill coming out with a gold medal. Alton Brown today won a silver medal in his competition,” said Foster. “The JOA has continued from where we left off last year in allowing our members to self-actualise on their dreams. Tony and the Karate Federation are fully on board with our 10 in 20 campaign and we expect the upcoming Pan-Am Games to be our most successful yet, with karate being there for the first time,” added Foster. The newly formed Jamaica Karate Federation (JKF), whose three-member team was fully backed by the JOA to represent the country in the sport for the first time at the Pan American Championships, is celebrating a historic win for Cargill and silver-medal finish for Alton Brown, on Saturday. Given her gold medal triumph, Cargill successfully qualified Jamaica for the sport’s debut in karate at the International Olympic Committee-sanctioned Pan-Am Games to be held in Lima, Peru, in August this year. It is a historic moment for Jamaica in this sport as it has never had any athlete compete at an IOC (International Olympic Committee)-backed tournament. Cargill beat Yoandra Moreno-Perez of Cuba, 5-1, before completely dominating Aguilar Lizetta from El Salvador, 3-0 in the final. This was Jamaica’s first attempt at qualifying since the newly formed World Karate Federation (WKF) approved the JKF. “I am forever grateful for the support of the JOA, my coaches Jason McKay and Raphael Veras, Jamaica WKF rep and Head of Delegation Nathaniel Peat, as well as JKF President Tony Robinson, my training partner Valentinya Zolotarova and my teammates Alton Brown and Kenneth Edwards,” Cargill further expressed. Now that she has qualified, Cargill has her eyes set on making it to the 2020 Olympic Games in Tokyo, Japan. She will be granted immediate qualification to the Olympics if they are successful at the Lima Pan-Am Games. Cargill and her teammates, former tae kwon do star and Olympian Edwards and Brown, a former European karate champion, participated at the Pan American senior championships, which took place from March 18-23 in Panama.